A couple formed by Sagittarius and Capricorn has reasonable levels of compatibility. However, before checking the compatibility, learn a bit more about each of these signs. Many astrologers say that between Sagittarius and Capricorn there are not many things in common, but regardless, a relationship between natives of these signs can be considered reasonably good. 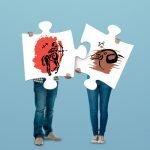 In order to achieve a good relationship, both partners will need to learn to appreciate each of their differences before they begin to feel comfortable together, so that the relationship can benefit and stabilize. Once this is done, the relationship between the two can become very successful. Sagittarius and Capricorn: how will the relationship work? Sagittarius can accuse Capricorn of being a little pessimistic and spoiler, while Capricorn, by his point of view, sees himself as a realistic and practical person, worthy of a trust that favors considerably the relationship. Sagittarius can come to despise Capricorn, especially if he becomes irresponsible, even though Capricorn sees this as being a progressive person. In such cases, there is a possibility that the truth is somewhere in between, and can be difficult to assess for any of them. The optimism of Sagittarius helps considerably to moderate the inclination that its Capricorn partner has to judge other people, while on the other hand Capricorn and Sagittarius help each other to achieve all their goals. In this sense, both should understand what the importance of working together in pursuit of their achievements is and then come to find a common theme. Just because its element is fire, Sagittarius turns out to be a very dynamic sign, while Capricorn maintains the peace of the earth element, allowing it to be fundamental that both learn to respect each of their temperamental differences. Sagittarius inspires enthusiasm in most cases to his partner Capricorn, and shows Sagittarius what may represent a slow but steady climb to success. We must be clear that this is not the easiest combination of the zodiac, although both have very different personalities. If they commit to working specifically for the well-being of the relationship, they will certainly be facing a successful and stable combination in the end. The only way to stay in a healthy sexual relationship is if Sagittarius respects his partner as much as Capricorn loses and respects the change that comes with the soul governed by Jupiter. Their meeting point lies in the great opponent of Capricorn, where the ruler of Sagittarius is exalted. In other words, their meeting place is in pure emotion.